One of the most influential titles in videogame history turns 20 today. At its 1993 launch, Id Software first-person shooter Doom was groundbreaking in ways too numerous to list. Although not the originator of the genre, it spawned dozens of clones, and contributed greatly to rising popularity of multiplayer gaming. It was also among the first games to feature a separate engine and assets, allowing users to create mods easily. The first third of the game was distributed as shareware, but the overall game was an instant hit. 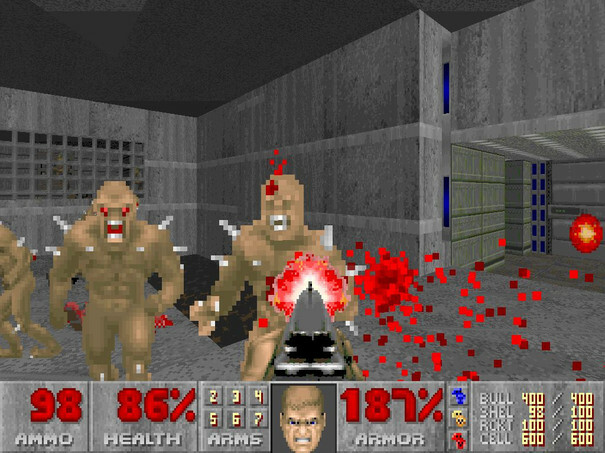 "We had made five first-person shooters before Doom," Doom writer Tom Hall told Polygon. "We released Wolfenstein, which had been a hit. But this was the first that had multiplayer, the one that innovated in lots of ways that are now standard in shooting games." However, Doom’s violent content saw it vilified in the mainstream media – something that continued long past its role of scapegoat for the 1999 Columbine High School massacre. Speaking with The Verge, legendary programmer John Carmack said that Id was “consciously making a powerful, violent game to affect people”. "It wasn’t to be something that you could just play for a little while and then forget that you ever played,” he said. “We did our job right because people remember it 20 years from the time that we wrote it. We made a mark on people, we left an impact. It was something that people cared about." In celebration of the game’s anniversary, Doom designer and programmer John Romero has posted some behind the scenes pictures to Facebook from around the time of the game’s release. An hour-long GDC 2011 post-mortem of the game featuring Tom Hall and John Romero is available to view at the GDC Vault. A fourth Doom game is in the works, but Id is being very coy with the details.